Donald Trump's potential energy secretary took President Obama to task for trying to "destroy" the U.S. oil boom. Harold Hamm, a shale oil billionaire, gave a speech on Wednesday night at the GOP Convention arguing that Trump will become the first president to achieve American energy independence. "President Obama chose not to get it, and he has tried to destroy this renaissance and all of its benefits," Hamm said in Cleveland. But the numbers tell a different story. Believe it or not, Obama has presided over the biggest increase in oil production in American history, even if he can't take direct credit for it all. Hamm is the leading contender to be Trump's energy secretary, GOP fundraiser and oil exec Dan Eberhart told CNNMoney. Neither the Trump campaign nor Hamm's Continental Resources (CLR) responded to requests for comment. Hamm's possible role was also reported by Reuters. Related: Does Donald Trump's plan to drill more oil make sense? The U.S. was pumping just 5.1 million barrels per day when Obama took office in January 2009, according to the U.S. Energy Information Administration. Fast forward to April and the U.S. produced 8.9 million barrels per day. That's an incredible 74% increase. In fact, in 2015, the U.S. pumped the most oil in 43 years. The U.S. is now the world's No. 1 petroleum producer when you count not just crude but also liquified natural gas. If you limit the ranking to just crude oil, the U.S. still comes in No. 3, just narrowly behind Russia and Saudi Arabia. Prices have recently collapsed by more than half since 2014. It's forced U.S. oil producers to pump less, because it's less profitable. Daily U.S. oil production has decline modestly from the peak and more slowing is likely. But the oil bust wasn't fueled by the White House. It was actually caused by an epic supply glut that formed in part due to American shale oil. "Oil prices have been depressed, but that's not a function of policy. 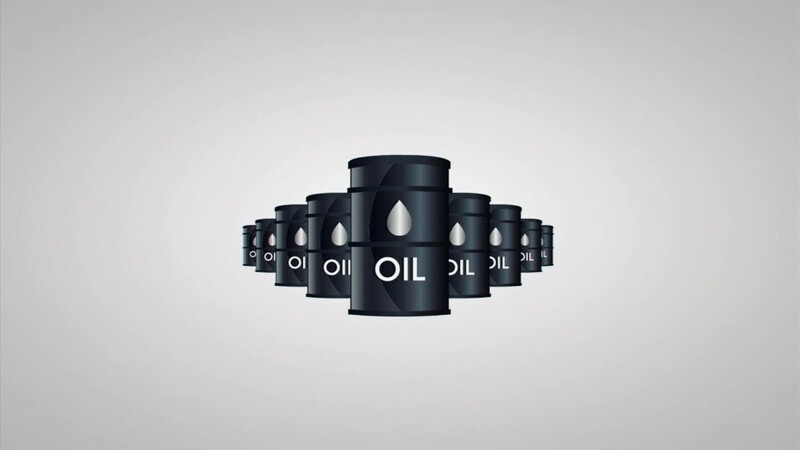 It's a function of global dynamics: we produced a lot -- and there wasn't a lot of demand for it," said Vincent Piazza, senior oil and gas analyst at Bloomberg Intelligence. Obama: Friend or foe of oil? Energy experts argue Obama's policies overall have neither been a positive nor a negative for oil production. Obama did place some restrictions on fracking, though he hasn't moved to ban the controversial tactic as Bernie Sanders and other environmentalists want. In fact, fracking now accounts for half of all U.S. oil output. The White House did place a temporary moratorium on Gulf of Mexico drilling after the Deepwater Horizon disaster. However, drilling in the Gulf of Mexico has rebounded and is on track to break a record next year. On the other hand, under Obama and the GOP-led Congress, the U.S. also removed the 40-year ban on crude oil exports, potentially allowing production to increase once prices rise. "I can't say what the administration has done has been a negative for the industry overall," said Piazza. Eberhart, the GOP fundraiser, disagrees, saying the White House has displayed "hostility" towards the energy industry and made it harder to drill by adding regulations "at an alarming rate." 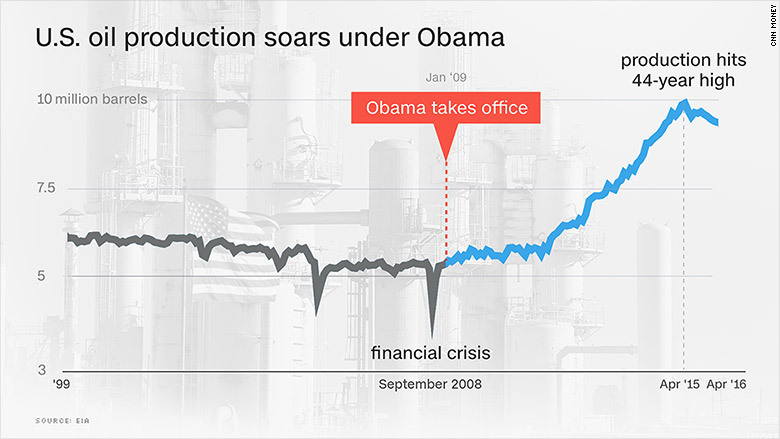 "The increased production is despite President Obama, not due to President Obama," Eberhart told CNNMoney. Trump faces a tall order in trying to make the U.S. energy independent. Last year, the EIA predicted the U.S. would achieve energy independence in 2028 if oil prices continue a modest and slow rise. The industry has made huge strides under Obama. The U.S. today has become more self reliant, importing about 10 million barrels per day, down from 14.5 million in 2006. But current imports still mean America relies on foreign oil for over half of its daily consumption. Hamm raised eyebrows by making a bold promise: U.S. oil production could double under Trump. But that would equate to 17 million barrels a day, a huge amount in today's world of excess supplies. It would be hard to convince oil companies to drill at that pace unless it becomes a lot more profitable. For that to happen, prices will have to rise dramatically. But again, if the U.S. ramps up production by that much, oil experts warn that prices will drop. "Unless you had a sustainable rise in demand and reductions from other countries, doubling production would just add to that oversupply," said Piazza. --CNN's Chris Isidore and Sonam Vashi contributed to this report.